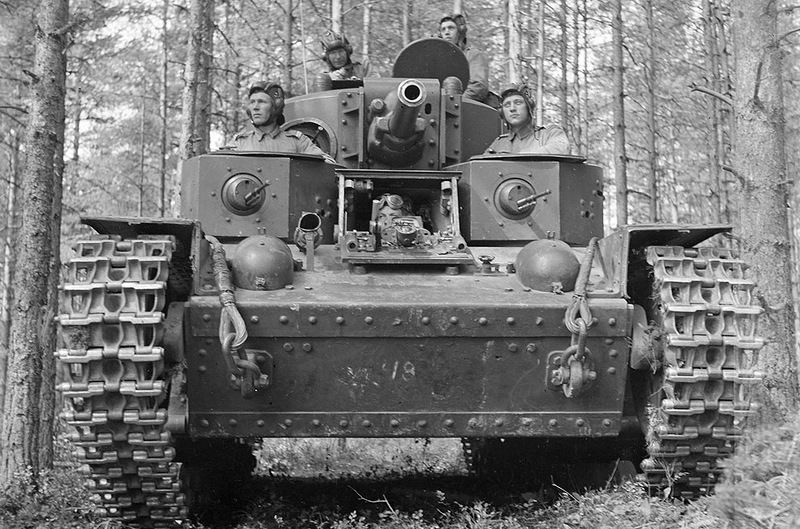 Finnish tank crew with captured T-8, July 8, 1941 (Photo: SA-Kuva). Eastern Front: In the Far North sector, Operation Arctic Fox produces its first significant success when German XXXVI Corps takes Salla on 8 July 1941. The Soviet 122nd Rifle Division retreats and is closely followed by the Germans and Finnish 6th Division. The fighting is bitter, and the Soviets lose 50 tanks and most of their artillery. SS Division Nord pursues Soviet 122nd Rifle Division toward Lampela, while German 169th Division advances toward Kayraly. Finnish 6th Division continues its left-hook maneuver and tries to get behind the Soviets retreating toward Kayraly and Lape Apa. In the Army Group North sector, the Germans of General Reinhardt's XXXXI Panzer Korps, 4th Panzer Group (Colonel General Erich Hoeppner) reach Pskov. The city sustains extensive damages, including the medieval citadel. This is the first major penetration of the Stalin Line. A little to the north, General Dietl's Army of Norway is stopped after establishing a bridgehead over the Litsa River, well short of its objective of Murmansk. 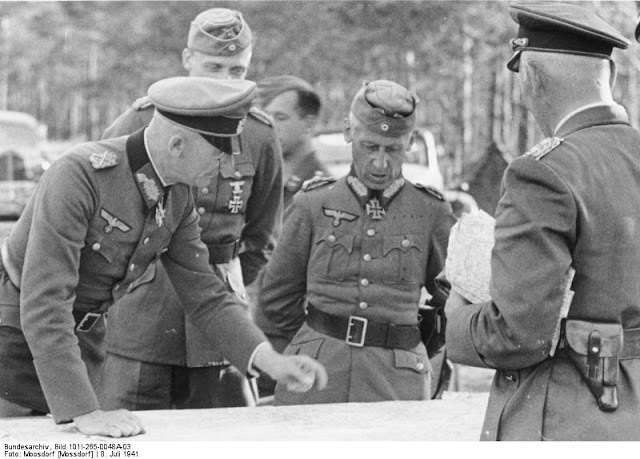 Field Marshal Fedor von Bock, Colonel Walther von Hünsdorff (hidden), Colonel-General Hermann Hoth, Colonel-General Wolfram von Richthofen. (Moosdorf/Mossdorf, Federal Archives, Bild 101I-265-0048A-03). In the Army Group Center sector, tank ace Otto Carius is in the lead tank of 20th Panzer Division (General Hoth's Panzer Group 3) at Ulla on the Dvina River when his Czech-built 38(t) tank is hit. The Russian 47-mm antitank round penetrates the front armor, smashes Carius' teeth and amputates the left arm of the radio operator. After being patched up, Carius hitchhikes to the front, now on the outskirts of Vitebsk (from Carius' "Tigers in the Mud"), and rejoins his unit. In the Army Group South sector, German Panzer Group 1 and Sixth Army run into a Soviet counterattack at Kishinev by Soviet 5th Army. The Germans simply reorient their advance slightly to the north. Luftwaffe ace (7 victories) Walter Margstein of JG 53 is killed in action. Syrian/Lebanon Campaign: Australian 2/3rd Battalion and 2/5th Battalion of 7th Division cut the road from Damour north to Beirut. In addition, in the south, 2/2nd Pioneer Battalion and units of 6th Divisional Cavalry Regiment march north along the coast road. Vichy General Henri Dentz, the commander of French forces in the Levant, has seen enough. Even though Damour itself still holds out, the Australian advance around Damour has made the defense of Beirut problematic. Dentz quietly seeks terms for peace. "RAF aerial photograph of Wilhelmshaven." © IWM (HU 91200). 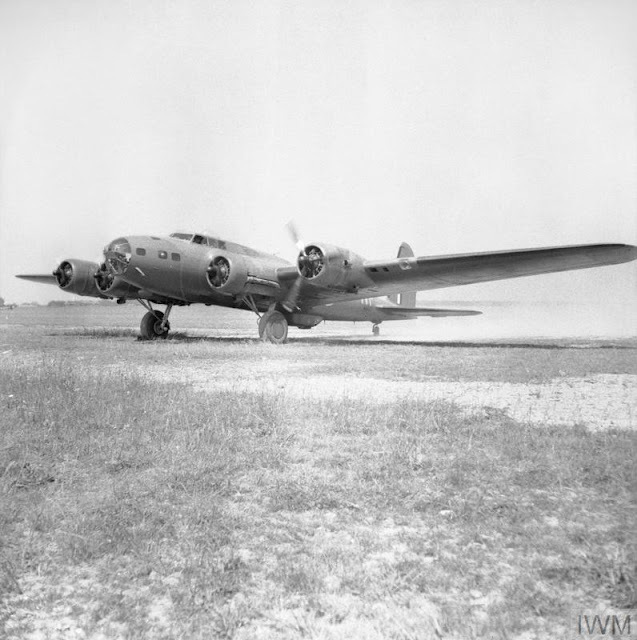 European Air Operations: The RAF has been accumulating and training on Boeing B-17C Flying Fortresses for months. Today, RAF Bomber Command sends the B-17s on their first operational mission, a daylight flight to Wilhelmshaven. Assigned to RAF Bomber Command's No. 90 Squadron based at Polebrook, Northamptonshire, the three B-17s fly individual sorties (one has to abort to a secondary target) rather than together as a formation. The RAF is unhappy with the results and makes clear that future bombing runs are to be conducted as formations rather than individually. 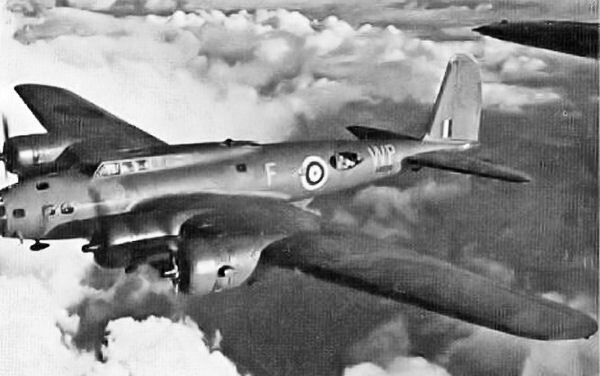 The crews complain of various shortcomings of the bombers, including difficulties using the Norden bombsight and inadequate defensive armament. 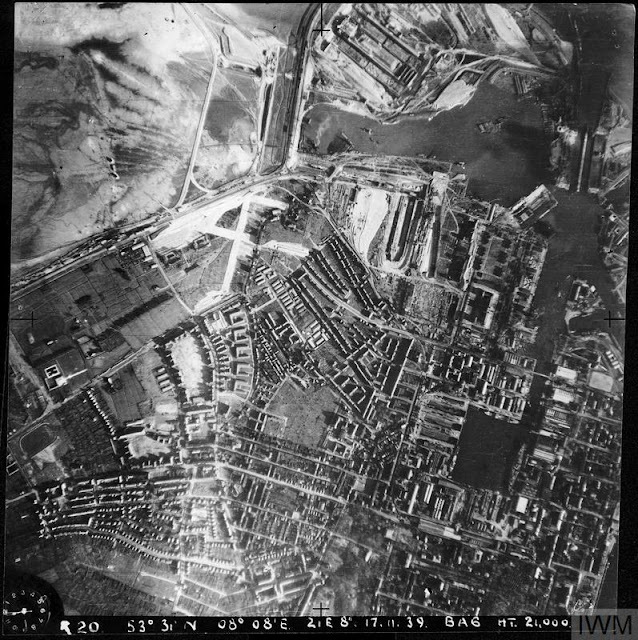 RAF Fighter Command sends Circus missions to attack the Lens power station (13 fighter squadrons, one bomber lost) and Lille (19 fighter squadrons, 7 losses). The RAF also sends a sweep over northern France. After dark, RAF Bomber Command attacks Muenster (51 bombers) and Hamm (73), Biefeld (33), and Merseburg (14). The Luftwaffe sends a night raid against Great Yarmouth, Norfolk. Fortress B.I AN530, WP-F (U.S.A.A.F. B-17C 40-2066) in RAF service (Royal Air Force). Battle of the Atlantic: Royal Navy submarine HMS Sealion sinks Vichy French trawlers Christus Regnat and St Pierre d'Alacantra off Ushant (Ouessant, Finistère). German 460-ton converted minesweeping trawler M-1104 Jan Hubert collides with another vessel off southwest Norway and sinks. Convoy HG-67 departs from Gibraltar bound for Liverpool. Canadian corvette HMCS Shediac (Lt. Commander Lt. John O. Every-Clayton) is commissioned. U-86, U-161 and U-656 are commissioned. Battle of the Mediterranean: Royal Navy submarine HMS Torbay surfaces east of the island of Kithera (Kythera), Greece and uses its deck gun to sink German freighters LXIV and LI. Royal Navy cruiser HMS Cornwall hits a wharf in Durban and sustains damage to its stem. At Malta, the Italian Regia Aeronautica sends bombing missions against various points. An RAF Hurricane shoots down an Italian BR-20 "Stork" medium bomber south of the island. "Boeing Fortress Mk I of No. 90 Squadron RAF based at West Raynham, Norfolk, 20 June 1941." © IWM (CH 2873). Axis Relations: The major European Axis powers officially carve up Yugoslavia. Yugoslavia's neighbors receive "a little something:"
The benefits of this carve-up to the recipients are few. However, they reflect long-held national desires for expansion into areas of "historic interest" and nationalism. Italian troops bear the brunt of occupation duty in the Balkans, including most of mainland Greece (the Germans occupy the remainder of mainland Greece and the islands of Lesbos, Chios, Samos, Melos, and Crete). Bulgaria, which is of little help on the main front, occupies eastern Macedonia and part of western Thrace. Hitler approves all this because divvying up an area of no interest to him binds his satellites closer to Germany. On a more practical level, it also removes the need for Wehrmacht troops to police the populace, and already the partisans are stirring. Romania has been promised extensive new holdings in the east, some of which already have been conquered. The Italian Embassy, Berlin. 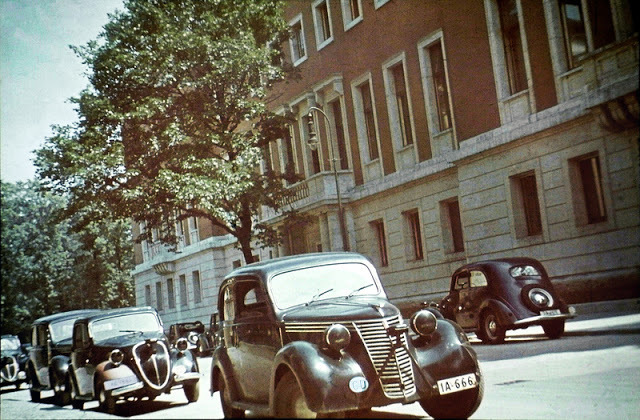 Note the blacked-out headlights and equipment for emergency lighting, in accordance with blackout regulations (Proietti, Ugo, Federal Archives, Bild 212-061). Anglo/Soviet Relations: A Soviet military mission arrives in London. Winston Churchill's first personal message to Soviet Premier Joseph Stalin arrives in Moscow. Churchill boasts about RAF Bomber Command's attacks on Germany and promises, "The longer the war lasts the more help we can give." German/US Relations: The American Embassy in Berlin arranges the release of American journalist Richard C. Hottelet. Arrested on espionage charges on 15 March 1941, Hottelet is a member of the so-called Murrow Boys, U.S. war correspondents recruited by CBS on-air reporter Edward R. Murrow. Hottelet soon heads for Lisbon, where he can catch a flight to London. US/Japanese Relations: Japanese Foreign Minister Matsuoka Yosuko sends a diplomatic note to US Ambassador to Japan Joseph Grew. It states that Japan desires peace and wishes to prevent the spread of war from Europe to the Pacific. 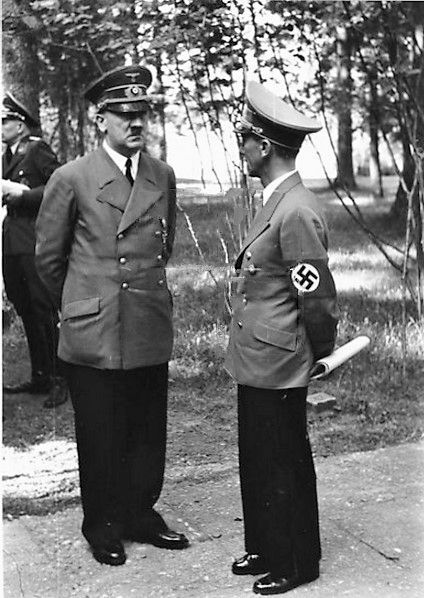 Hitler with Propaganda Minister Joseph Goebbels at the Wolfschanze in Rastenburg, East Prussia, 8 July 1941. 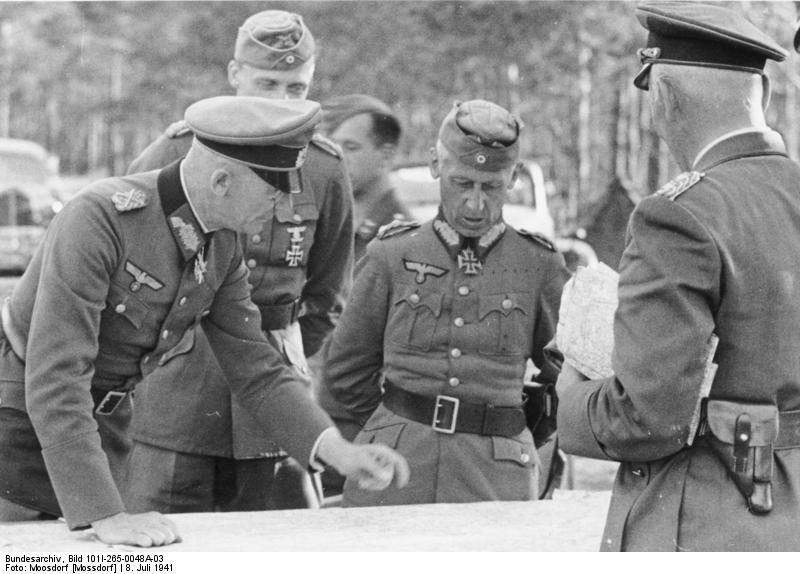 German Military: OKW operations chief Franz Halder briefs Hitler on the progress of the war in the Soviet Union. It is an encouraging briefing in which Halder claims that the Wehrmacht has pretty much destroyed 89 of 164 known Soviet rifle divisions (which is a vast overstatement). However, Halder insists that more power is needed on the eastern front, so Hitler releases 70 Mark IIIs, 15 Mark IVs, and the remaining Czech tanks from the OKW reserve. Management and use of reserves will be a huge topic of disagreement between the OKH (army command) and OKW (overall military command) throughout the war. US Military: Patrol Wing 8 (Fleet Air Wing 8) is established at Naval Air Facility Breezy Point, Norfolk, Virginia. It later moves to Alameda, California. While not technically a part of the US military, in substance it is an extension of the US Army Air Force. Today, pilots and staff of the American Volunteer Group (actually employed by a shell company) depart San Francisco for the Far East aboard Java Pacific liner "Jaegerfontein." In Memphis, Tennessee, Army Major General Benjamin Lear, Commander of US Second Army, happens to observe some of his troops whistling at women passers-by while driving by. Lear makes all 350 men in the convoy walk the remaining 15 miles (24 km) to their destination. The troops' commander, Major General Ralph E. Truman (cousin of Harry), attempts to get Lear "retired" but fails. From this point forward, the rank and file call him "Yoo-hoo Lear." Battleship USS Arizona arrives at Pearl Harbor. British Military: Cadet David George Montagu Hay receives the Albert Medal for Lifesaving. Hay - who later becomes the 12th Marquess of Tweeddale - jumped out of a lifeboat after the sinking of freighter SS Eurylochus by German raider Kormoran on 29 January 1941 to rescue an officer without regard to his own safety. 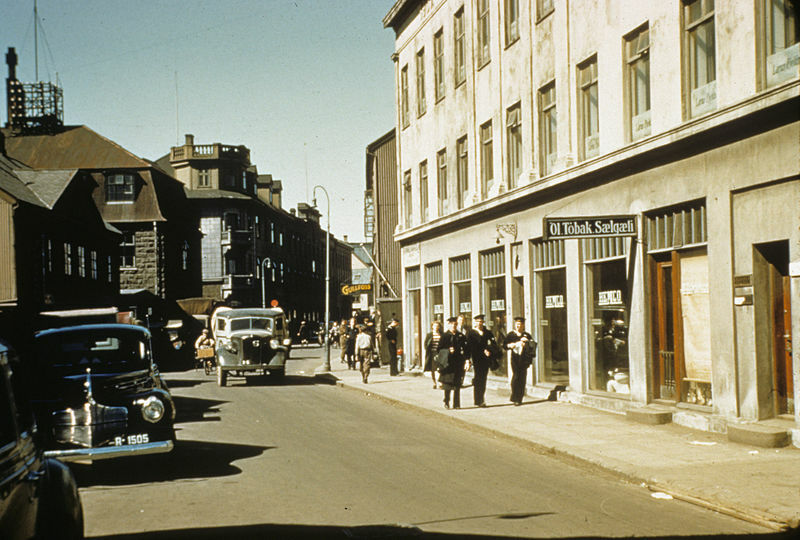 Reykjavik, Iceland, 8 July 1941. US Marines landed on 7 July in order to relieve British troops and allow them to return to England. China: There is a Japanese air raid on Chungking, the Nationalist Capital. The British Embassy, already damaged in previous attacks, is destroyed during the raid. Holocaust: Jews in the Baltic States are forced to wear the Yellow Star of David badge. Soviet Homefront: The government institutes food rationing in major cities. "supreme worth of the individual"
"the law was made for man and not man for the law"
"the rendering of useful service"
"an all-wise and all-loving God"
Rockefeller urges everyone to support the United Service Organizations to create a new world that recognizes "the brotherhood of man." Major League Baseball holds its annual All-Star Game at Briggs Stadium in Detroit. With the American League trailing 5-4 in the bottom of the ninth inning, Ted Williams hits a three-run home run to earn a 7-5 victory for the American League (Joe DiMaggio, on first base, actually scores the winning run). Williams later comments that the walk-off home run "remains to this day the most thrilling hit of my life." 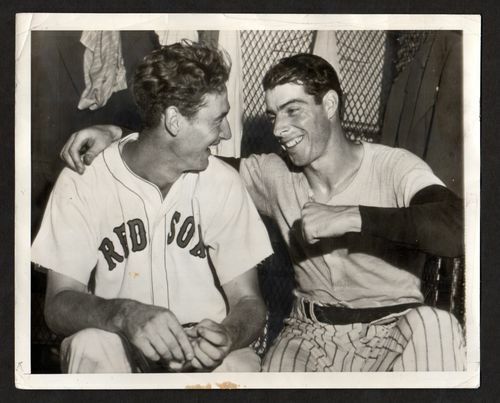 Ted Williams and Joe DiMaggio at the All-Star Game held on July 8, 1941.